Introducing Vphase, and why we recommend installing one. So how can we help you on your way to being greener? well your one step nearer. start saving the planet AND money (Can’t say fairer than that)….. Tried & tested technology to save you money & reduce your CO² footprint. VPhase is a new product aimed at the domestic sector which is a affordable & realistic way of saving money & your family’s reducing CO² footprint. The average house hold will save approximately £110 a year and so the unit is expected to have paid for it´self within 3 years. National statistics show that the average family stay in their homes for at least 4 years, so you will see a return on your investment; But not only that all your appliances – from your light bulbs through to your washing machine will last longer. They are all designed to work on a supply voltage of 230v ± 10% (so 207v to 253v) with the average supply voltage in the North East Hampshire & Berkshire area of around 247v you can see that we are in the upper end of the manufacturers recommendations. If you take a light bulb the manufactures give approximate 10,000 hours life with an increase of 5v from the designed 230v will reduce the life by HALF!! This method is the easiest & best way of going green as it doesn’t require you to change your lifestyle AT ALL!! just get it installed and save, of course it wouldn’t hurt to turn off the lights either!! We’re proud to announce that VPhase was awarded Electrical Residential / Domestic Product of the Year 2010. This prestigious industry award marks a huge success for VPhase and further cements the genuine benefits voltage optimisation can deliver to the home. 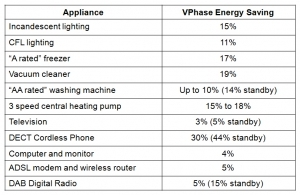 Below is a table & graph showing the advantages of having a VPhase installed in your property. These test were conducted by independent company. 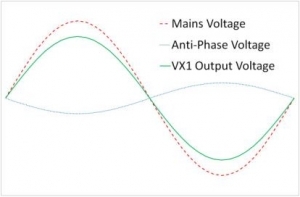 The VX1 has internal power losses of ≈ 1.5%. Our calculation of saving 10% for a typical home is a Nett saving, i.e. 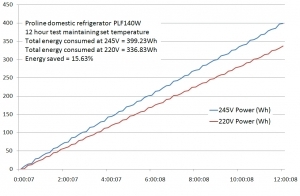 the VX1 power loss is factored into the calculation. WOW did you get all that?? Here are our customers’ Frequently Asked Question’s! • Energy saving light bulbs with all Distribution Board Upgrades. • Smoke & Heat Detectors, We will install mains voltage interlinked Smoke & Heat Detectors in your home for FREE. Copyright © 2007 - 2019 RF Cox & Son Electrical Services Ltd All Rights Reserved.